I just released WRobot 2.0. It is mainly UI update, but I have added some features like LuaBot language (to make your WRobot plugins/scripts with lua, you can launch the dev tool to see code sample), better vb.net support... (I'll write changelog in next days). If you get problem to launch it, check if you use recent Framework version (min 4.5), Windows XP support has ended. In the next week, I'll primarily work during next weeks/months to improve artificial intelligence/movement/reaction of the bot to try to look more natural (for that I will also have to improve my personal knowledge). A lot of users abuse of the "unlimited sessions by IP", I think than I'll change rules for the new subscriptions (like 1 session for 20€ per year, 5 for 30€/y...), and probably limit number of session of the old subscriptions (like max 25 sessions, some user running currently more than 100 sessions at the same time...). As said here WRobot will be a bot only for private servers, I need to edit/reorganize sites/forums/downloads for that (I'll do it in next weeks). EDIT 25 April 2018: If you get black WRobot window read this, if WRobot closes automatically when you use the same key on multiple IP address at the same time it is normal, an old bug allowed to do it (with unlimited and private subscriptions) but it was fix in this update. EDIT 26 April 2018: I edited homepage to formalize than WRobot is a private servers bot. I also added new type of subscription, based maximum of running sessions at the same time (no IP limit, it is better if you want to use several IPs), but you cannot run at the same time more than X sessions at the same time), and I converted old "unlimited" and "for private servers" subscriptions to the new type of subscription with the maximum of 10 sessions at the same time. You can see new subcriptions and the price in the store. I repeat, update of WRobot for official servers was planned before than I decide to stop this version, I released it but this but that does not change my decision, I will definitely close WRobot for official server at the latest at the "Battle for Azeroth" pre-patch (Wow version 8.x.x) . 17:50:44 - [SpellManager] Spellbook loaded. Hello. 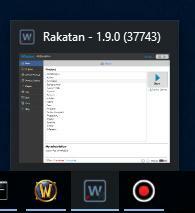 When i run new wrobot.exe or relogger instead of Wrobot/relogger shows black window. Old version is launched normal. What could it be? This problem only on 1 of 3 PC. Check if your framework version is updated, you can also try to close WRobot and edit with notepad file "WRobot\Settings\RobotManagerGlobalSetting.xml" and replace "<CanProtectAgainstScreenshots>true</CanProtectAgainstScreenshots>" by "<CanProtectAgainstScreenshots>false</CanProtectAgainstScreenshots>"
esse wrobot 2.0 esta pegando no pre-patch batalha por azeroth ?? se estiver pegando como faço para usa-lo porque sou brasileiro?? e como faço para comprar?? esse wrobot 2.0 esta pegando no pre-patch batalha por azeroth ?? se você está pegando como fazer para usa-lo porque sou brasileiro ?? e como faço para comprar ?? Framework is updated. RobotManagerGlobalSetting.xml does not have this line. I added <CanProtectAgainstScreenshots>false</CanProtectAgainstScreenshots> but it did not help. Yes it is remote deskop, but I'm using AMMY instead TeamViewer. Can you make it so CHARNAME on top of the window anchors to the right, and aligns towards left? So it doesn't say Ordu.... as charname, when there lots of space for the full name. Also, can you add CHARNAME as text to the window name on the taskbar again? EDIT 26 April 2018: I edited homepage to formalize than WRobot is a private servers bot. I also added new type of subscription, based maximum of running sessions at the same time (no IP limit, it is better if you want to use several IPs), but you cannot run at the same time more than X sessions at the same time), and I converted old "unlimited" and "for private servers" subscriptions to the new type of subscription with the maximum of 10 sessions at the same time. hi you able to add nickname when wrobot minimized? hi you able to add nickname when wrobot minim﻿ized? when will the unlimited subscription limit come into effect? its able to be automatic when before? It's actually not a rise in price. He is cutting of Retail, making private servers his new focus. Meaning the price is just transfering. However, those who has already bought private server, can't be affected by this, since he'd then change the service that has been paid for. So he is adjusting future services for what is "private server services". And changing current accordingly. so if I have a subscription I will not be affected by the reduction in the number of sessions? when will the time come to renew will need to buy 3 subscriptions for 10 sessions? I had lifetime/10yr sub for unlimited and now it's expiring in 4 months. That was for both private and retail and that was affected. From a private standpoint, those prices are high. Funny how retail floated private and how people who use private were happy retail was going away. How happy are all of you paying that much higher price now? It's mainly because of users like you that I had to make this change. If you can tell me how you usage is legit. If someone have to run more than 10 sessions do not hesitate to send me private message I'll found solution, but I think than 99,9% of legit users will not affected by this change (same advantage because I remove the limitation by IP). If you can tell me how you usage is legit. After if someone have run more than 10 sessions do not hesitate to send me private message I'll found solution, but I think than 99,9% of legit users will not affected by this change (same advantage because I remove the limitation by IP). maybe you able to add per month subsription becouse its much money for paying at once?